There have been so many people on YouTube talking about this grand historical fiction novel following a blind girl and orphan boy during World War II. I am really fascinated by anything that takes place during WWII but have yet to read a book during that time period! I've wanted to read this book for a while, but I haven't been able to find a copy in the Canadian cover! Albertine from Lovely Rose Petal just finished reading this book and loved it, so I couldn't not add it to my list. I haven't heard a single bad thing about Falling into Place, so it needs to be physically added to my TBR pile soon. I would really like this book in my hands right now (as you may have inferred from my first Waiting on Wednesday post last month.) Like I mentioned, I'll read anything Gayle writes! Even though I think this series should have ended as a trilogy, I still can't help but be excited to read this. The cover is B-E-A-U-TIFUL! Although the topic of cheating doesn't interest me, Jillian from Bookish and Nerdy likes Katie Cotugno as a writer, so ... I would like to read this book. Yes. 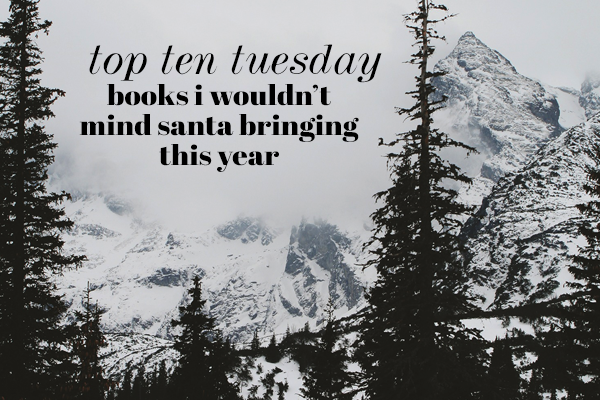 I know I chose ten, but which ONE book would you want to see under your Christmas tree? Have you read any of the ones I picked? If you were Santa, which books would you bring your friends who don't read? Gayle Forman!!! I love her and absolutely can't wait for her new book! Same for 99 days! It looks so good! Hopefully Santa leaves you some goodies under the tree this year! Here's my Top Ten! I love Gayleo Forman's books, but I Was Here didn't end up floating my boat. Boo. But I read Where She Went just a few weeks back and *swoons* I adore her writing style. XD Also her characters. They are adorable. Thank you Jessica! I didn't love or hate If I Stay/Where She Went, but I'm really excited for I Was Here! SO many people have been saying great things about Dangerous Girls! I really need to borrow a copy from the library soon. I liked Where She Went, but If I Stay was just okay to me. We'll see what happens with I Was Here soon ... I guess it could go either way!